As much as I love reading The Broke and the Bookish, I don't typically participate in their Top Ten Tuesday link-up because I already have my own Tuesday link-up. But then I had a brilliant idea: Why don't I just post my answers on Monday and still link up on Tuesday? Genius! So here's my list for this week: the top ten books I hope to read this fall. And finally, the last books I selected are books I started in the past year or two and just never finished. As part of my 24 Before 24 list, though, I really want to clean up my currently reading shelf! Speaking of reading challenges, I need your help finding a few good books to fulfill the color challenges I signed up for! I can't think of any books with "green" or "brown" (or a variation, e.g. emerald, lime, forest, jade, beige, tan, chocolate, etc.) in the title. Do you have any suggestions for me? I actually read The Boy Next Door in high school. I don't remember much about it, but I do remember enjoying it. I rarely read that type of fiction, but I really do like several of Meg Cabot's books, including the Princess Diaries. I can't think of a "brown" book (and trust me, I tried... you had me brainstorming in the shower. haha) but my favorite "gree" book is Anne of Green Gables. The Green Mile is another good one. You're likely to have read both, but those were the best ones I could come up with. I read the night circus at the beginning of the year. Wasn't my favorite but i did enjoy it. Half the Sky is eye opening and just so touching. What a read. I still have to read The Night Circus. Good luck getting through your list! 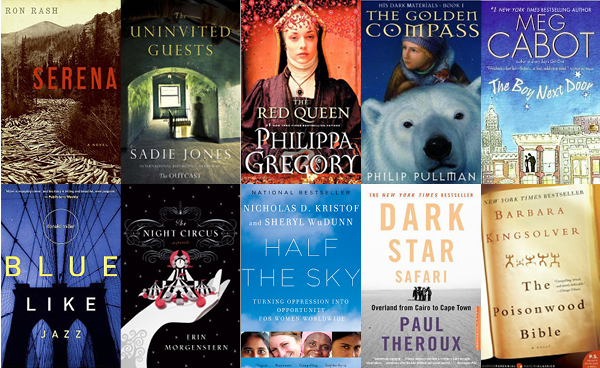 We haven't read any of these but we should definitely get on The Golden Compass! Ooo! I love this list. I've read 4 of these: The Golden Compass, Blue Like Jazz, The Night Circus, and The Poisonwood Bible. I love BLJ, read it a few times. I didn't like the Golden Compass so much, but it was an interesting read. The Night Circus was really good. I wrote a blog post review of the Poisonwood Bible. I'm interested to know what you think of that one. I've had a few Philippa Gregory books on my to-read list for a while now, and I haven't heard of any of the other ones. I want to read Serena now! Interesting that Bradley Cooper and Jennifer Lawrence are doing another movie together. As for the colors, I really can't think of anything off the top of my head. I'll let you know if I do! That's a hard one.